The second exhibit I have coming up next month is at the Barn Gallery, home of Ogunquit Art Association. I will be one of the Showcase artists for our last exhibit of the season. The exhibit runs from September 12 – October 8, 2018. There is a gallery talk on Thursday, September 13 at 6pm and a reception on Saturday, September 15 from 5 to 7:30pm. I’m very excited about this exhibit. It was a chance for me to take some time to explore and experiment with a few of the ideas swirling around in my head and some already on paper. I’ve been working on my Land Project paintings off and on for a number of years. This was a chance to do some concentrated work on my abstract take on the landscape. Paintings of my family farm include bits and pieces of family history and make me think of a treasure map more than anything. Other paintings are a combination of aerial view and map view. These depict geographic variances as well as the “imaginary” boundaries of property lines and political divisions. Some are more sketch than anything else. Some are relatively realistic and others are just whimsical. Although, it’s been fun to just play around with these ideas, it’s daunting to figure out where to go next. I want to explore all these different paths, but in what order and intensity? I’m really excited about both of these opportunities. The first one is at The Gallery at WREN (Women’s Rural Entrepreneurial Network) in Bethlehem, NH. I’m exhibiting with two other NH artist friends, Rosemary Conroy and Ann Trainor Dominque. Although I’ve known both Rosemary and Ann a long time, this is our first group exhibit. “Color Love – 3 Artists, 3 Visions” will run from September 7th through October 1st. Our artists’ reception is Friday, September 7th from 5 to 7pm. And let me tell you, it’s all about the color! There will be a roomful of vibrant color for you to check out. And in quite a range of sizes. I can pretty much guarantee that my pieces are the smallest, most of them ranging from 4 inches square to 8 inches square, the perfect size to tuck a bit of color and inspiration into a corner, a bookcase, or a nightstand. Ann and Rosemary will both have larger pieces, strong enough to hold the focus of your room. I think this is going to be an incredible exhibit with lots to offer both buyers and viewers. Come on the evening of the 7th to meet the artists or come later in the show when it might be a bit quieter. The next phase started in late July. I started a slightly different series. These were done on a slightly different playing card, one with 2 opposing corners cut off. When I went to buy more cards, I found these. They seemed like the same size, so I just went ahead. The different shape made me think a bit differently about these. I drew a fairly simple grid that was “off”, just a little bit funky. It’s a format that I’ve experimented with in the past. This format seemed right for words. The off kilter grid left an uneven border. I filled some of the borders with words. Words of prayer, words of hope, words of love. Some days these were prayers for healing and patience. Other times, it might be a thank you for a particularly lovely day, but more often a general thank you for the blessings we often take for granted – Health, Love, Family, Home. They have evolved to be part daily prayer and part gratitude journal. By June, I had established a routine. 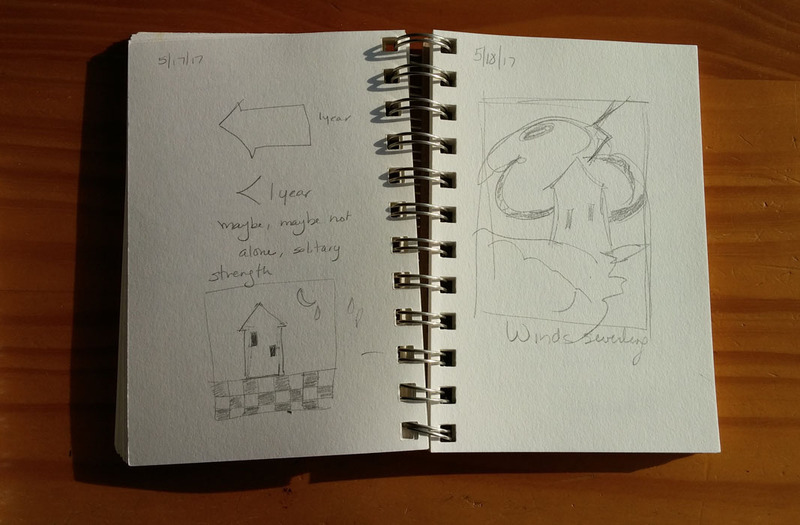 I was doing at least one sketch in my sketchbook and one on my origami covered playing cards. And it occurred to me that it might be good to share these with the world. There were a couple of reasons to do this. First of all, art doesn’t do much if it’s stuck in a drawer and no one sees it. The other reason to share it was to see what others thought. I also had to get over the equally obvious reasons not to share. First, this work is very different than what I had been working on. Second, I’m just starting, so nothing is polished. Third, it was hard for me to decide how much to share. The most immediate way seemed to be Instagram. I could take a photo with my phone and then immediately post it to Instagram. It was simple and quick. That meant it was simple to add this additional step to my art making routine. To keep things simple, I haven’t done much editing. I’ve posted daily even when I wasn’t overjoyed with my results. You can catch my feed @ethelhills. This has another advantage. I quickly added a brief review of my feed when I was done posting my pieces. That’s given me the opportunity to see what other artists and friends have been up to. Throughout all of this, I’ve been trying to find a daily art practice that would sustain me during a difficult time in my life. I figured that it had to be small and portable. After doing some daily sketching and thinking, I came up with an interesting idea. Why not use an unusual surface and size? What about using playing cards? They’re easily available, relatively consistent in terms of size, tiny enough to carry easily and just stiff enough for a very small piece of art. After several false starts, I came up with the idea of gluing colorful Origami paper over the playing cards. That gave me the color I crave while maintaining the simplicity of the earlier black and white drawings. Almost 10 years ago, I started doing small landscape collages under similar circumstances. I needed something small that I could work on in small chunks of time. Sometimes, your art has to fit the time and space available. That’s often when something really interesting happens. Back in April I started a very teeny tiny art practice. The intent was something small, doable, and daily. Other than that, I didn’t really have a lot of constraints. I started with just a page in a small sketchbook. It started out as just that, one page. It didn’t even have to be a piece of art, it could be notes, or questions, or ideas for future projects. Just something about art put down on paper. I started out with a small 4 x 6 sketchbook, just because it was convenient. And I fell in love with these small sketches and explorations, always working in pencil, which is not my normal media. I think the switch in medium and the use of the sketchbook helped me avoid the trap of immediately worrying about a finished product. These felt like thoughts and ideas, not finished works of art. But it was a beginning. I had the beginnings of my daily art practice. It was very teeny tiny, but it was a start. Life is uncertain. This fact is hammered home all the time. You lose a friend quite suddenly, you experience a natural disaster, a crazy driver misses the bend in the road and drives into your house, you trip doing something you’ve done a hundred times and end up in the Emergency Room with multiple fractures and a whole new set of limitations. Life can change on a dime in a million different ways. • Take it one day at a time, or one hour, or one minute. • Count my blessings. And there are lots of them. • Keep art in my life. • Don’t forget to breathe. • Get some exercise, outside if possible. About 4 months ago, I started a very small daily art practice to ensure that I “keep art in my life” during a difficult time. That was the beginning of Art Everyday. I started with getting something in my sketchbook every evening before going to sleep. Sometimes a sketch, sometimes just an idea or a project to consider. For a more complete view of my current art, please refer to my website - www.ethelhills.com. This space will continue to deal with what's going on in my art life in a little bit more detail.